Come one, come all and behold the future of space travel: steam power! No, seriously; half a century after the world's first manned space mission, it seems that interplanetary travel has finally entered the steam age. Scientists at the University of Central Florida (UCF) have teamed up with Honeybee Robotics, a private space and mining tech company based in California, to develop a small, steam-powered spacecraft capable of sucking its fuel right out of the asteroids, planets and moons it's exploring. "We could potentially use this technology to hop on the moon, Ceres, Europa, Titan, Pluto, the poles of Mercury, asteroids — anywhere there is water and sufficiently low gravity," Phil Metzger, a UCF space scientist and one of the chief minds behind the steampunk starship, said in a statement. Metzger added that such a self-sufficient spacecraft could explore the cosmos "forever." Metzger and his colleagues call the lander WINE (short for “World Is Not Enough”), and a prototype of the craft recently completed its first test mission on a simulated asteroid surface in California. 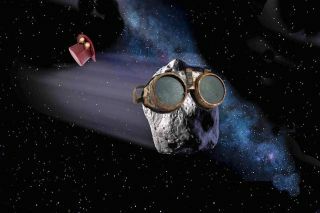 Using a compact drilling apparatus, the lander successfully mined the fake comet for water, converted that H20 into rocket propellant and launched itself into the air using a set of steam-powered thrusters. While the phrase "steam-powered spaceship" might initially evoke images of a rusty, gear-laden, fog-belching bucket of bolts, the technology behind WINE is far more complex than it sounds. To get the prototype working just right, Metzger spent three years developing new steam propulsion computer models and equations to help WINE optimize its operations in response to the varying gravitational demands of its surroundings. If a WINE-like robot ever makes it to space, built-in solar panels could provide it with the initial energy needed to start its off-world drilling operations. The successful test run is a big feather in WINE's proverbial steampunk top hat, but there's a long way to go before the lander can be tested in an actual space environment. NASA sees value in the potentially self-sufficient starship and helped fund the early stages of the project; now, the developers are seeking new partners to help take WINE out of the lab and onto another world.